Before there was Photoshop and digital cameras the film we choose determined the look and style of our photography. One of the ways that you can set yourself apart creatively from other photographers is to do something they aren’t doing. Show people a vision (your interpretation) of things in the world they have not seen before. So, anytime I could push the boundaries and alter reality I would chose a film of alternate wavelength (infrared!) in either color or Black & White. 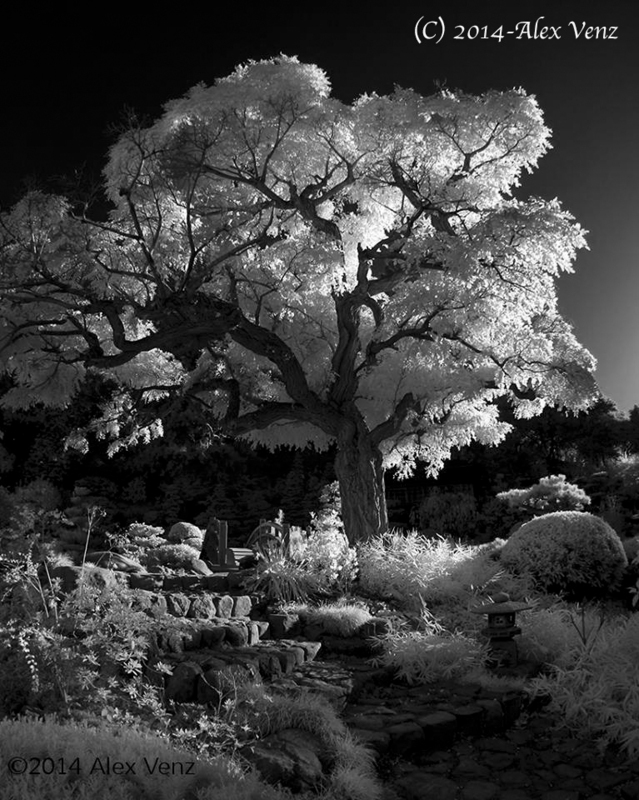 For B&W infrared I used Kodak Professional High speed infrared film (HIE) in 35mm format. It covered the visible spectrum, some ultra violet radiation, and to about 900nm in the infrared region. Kodak suggested using a No. 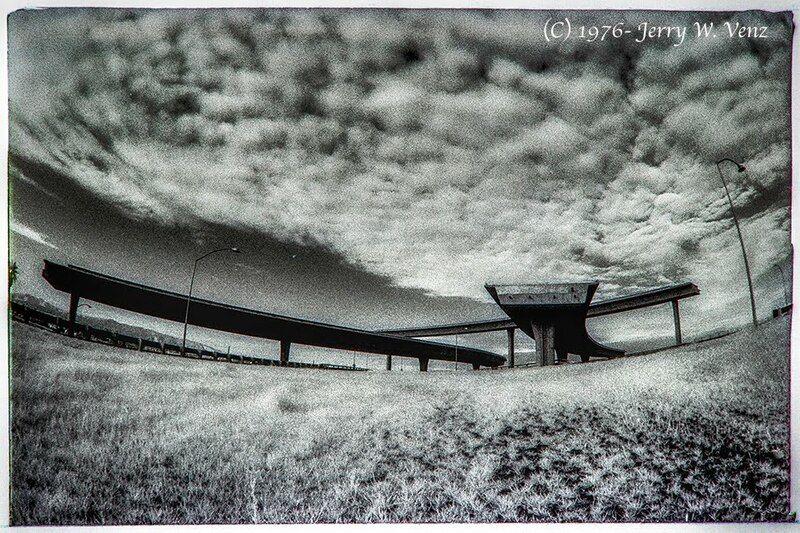 25 red filter on the lens and 50 ASA while bracketing exposure four or five stops. Because of its sensitivity you had to load the film into the camera in total darkness. I liked using my Minolta 16mm fisheye lens when doing infrared because of its tremendous depth-of-field kept everything in focus (you can’t focus your lens for the infrared spectrum) and this lens has several built in filters, on a rotating bezel, that made it easy to use with B&W or Color infrared. The only filter it was lacking was the NO. 25 red—that’s why I used the 056 (orange) filter when doing B&W infrared. What I really liked about using film for infrared photography was that beautiful grain! The grain gave the image a texture that I don’t see these days using digital techniques. By way of comparison here’s a modern digital infrared image my son created using his converted DSLR…. My son, Alex, had his camera converted to capture infrared by Life Pixel. What’s nice about his modification is that his camera will create both B&W and Color infrared images. In the old film days we had to change films to do that. I guess the bad thing is that once converted that camera will ONLY do infrared capture. I think Alex created a fabulous artistic vision here (at the Japanese Hakone Gardens in Saratoga, California) that rivals any modern infrared I’ve seen to date. (In my totally unbiased, humble, opinion!) What strikes me first about these digital IR converted cameras is the smoothness of their images. There’s no apparent grain and the hard clarity they produce is often hard to look at. I guess I’m just old school—I miss the look of grain in B&W films like Kodak Infrared, and Later T-Max 3200 (pushed at least 1-stop). Sadly, these films are long gone—yes we still have Tri-X, but for how long?